Over the past few weeks, tender green spears have begun cropping up in delectable bundles at the farmers markets and in my favorite produce stores. The husband and I have already indulged several times and plan to eat lots more before asparagus season ends. 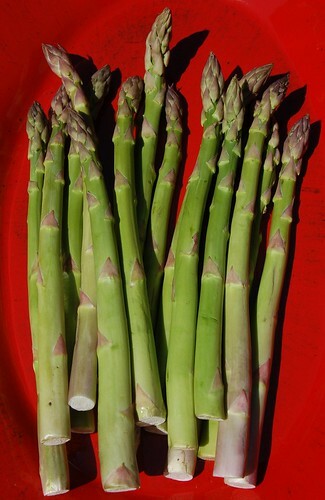 Asparagus, like so many others, is a food that's not really worth eating out of season, both because it's tasteless and woody-stemmed and also because it takes gallons of fossil fuel to grow and ship those tasteless stalks to you from afar. Below is the basic recipe. These are just rough estimates and you should feel free to play around with the proportions as it would be pretty hard to go wrong when you're working with these ingredients. Hope you enjoy this first taste of spring! 2. 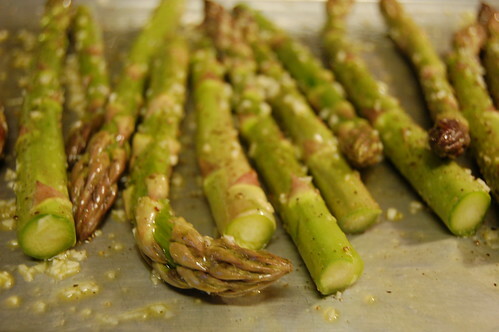 Place the asparagus spears in a large bowl then add the olive oil and garlic and toss to coat. Season with salt and pepper to taste. 3. Transfer the spears onto a thick metal baking sheet and arrange in one even layer so that each spear is touching the sheet. 4. Roast for 15-30 minutes to desired consistency. Cooking times will vary based on the thickness of the spears and how well roasted you like them (I like mine pretty well done). Remove from oven and transfer to a serving dish. These are a great accompaniment to almost anything - meat, fish, grains, etc. You can also add them to a salad or serve them as part of a mezze offering. 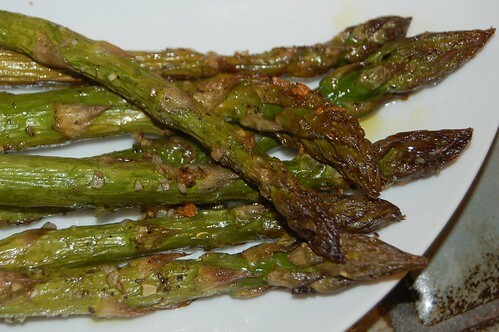 Roasted asparagus is also a good dish to include in a Passover seder. truly, there is no better way to eat asparagus. i love it when the fresh stuff starts showing up. if only the season weren't so short! 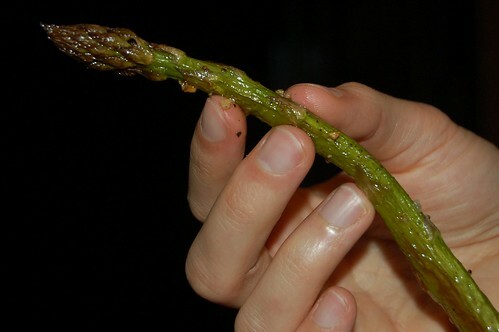 i make up for it by eating asparagus several times a week. mmmm. I just cooked some last week. Next time I will try the Roasting! I can't wait. The pictures looked so yum that just reading the post made my pee smell funny.